Various Locations Throughout Portland: Including St. Nicholas Orthodox Church, the Hellenic – American Cultural Center and Museum, St. Clare Parish, St. Stephen's Church, St. Mary's Cathedral, and Trinity Episcopal Cathedral,. 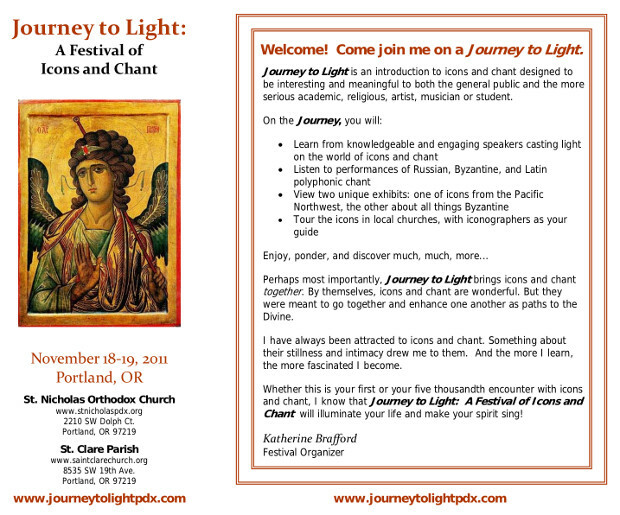 Journey to Light is an introduction to icons and chant designed to be interesting and meaningful to both the general public and the more serious academic, religious, artist, musician or student. The Festival is presented in cooperation with Cappella Romana, Cantores in Ecclesia, the Iconographic Arts Institute, and the Trinity Iconography Institute at Trinity Episcopal Cathedral. It is co-hosted by St. Nicholas Orthodox Church and St. Clare Parish. For more information and to register go to www.journeytolightpdx.com. This entry was posted in events and tagged chant, icons. Bookmark the permalink.